The world is open for business… your business! Today it’s easier than ever for companies, regardless of size, to sell goods and services across the globe. Hawaii is an internationally recognized brand that helps make its products and services attractive to buyers throughout the world. 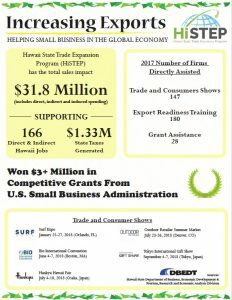 Funded in part through a Grant with the U.S. Small Business Administration (SBA), Hawaii’s State Trade Expansion Program, known as HiSTEP, is a comprehensive program designed to assist Hawaii small businesses with their export development. The program is administered by DBEDT and partner organizations in Hawaii. SBA started STEP in FY 2011 as a three-year pilot program with a goal to increase the number of small businesses that want to export as well as the value of exports for those small businesses that currently export. SBA awards matching-funds STEP grants to states on a competitive basis. The request for proposal (RFP) for HiSTEP-CA is now closed for 2019. Priority for selection to participate in the Hawaii Pavilion will be given to companies whose Hawaii-made product meets the “Made in Hawaii” designation as defined under Hawaii Revised Statutes Section 468-119, stipulating that the product will have at least 51% of the wholesale value added by manufacture, assembly, fabrication, or production within the State. For service providers, the eligibility requirement is that the company be registered to do business in the State of Hawaii and the service, although for a foreign market, is substantially performed in Hawaii. For companies that may be unsure if they are export ready, please take the Export Questionnaire on the U.S. Department of Commerce’s website at: http://export.gov/begin/assessment.asp Upon completion, the questionnaire will give you an Export Readiness Assessment score based upon your responses. Training and business advising program to prepare Hawaii companies to begin or expand their export market development. The Export Readiness Training is a foundation program that is open to all types of businesses considering exporting. It will cover general background as well as country and issue specific topics. HiSTEP-ERP also includes one-on-one business and export advising in cooperation with DBEDT’s partner organizations. At the conclusion of the program, companies will have a go-to-market strategy and export plan. The sessions are expected to cover subjects ranging from scaling up operations, to logistics, to managing cultural differences. Trade shows can be an excellent venue to find new buyers, promote your products, and increase awareness of your brand. Learn the do's and don'ts of international trade shows, including preparing for, attending, and turning prospects into buyers after the show. DBEDT and partners such as the Hawaii Department of Agriculture organize groups of Hawaii companies to participate in major trade shows in a Hawaii pavilion. For Hawaii companies seeking to participate in food-focused trade shows, such as FoodEx Japan, please contact Yukashi Smith at the Hawaii Dept. of Agriculture, Yukashi.M.Smith@hawaii.gov. Also, please visit the HDOA website to find a list of food-focused trade shows. Space is limited and will be on a first come first serve basis. To sign up complete the 2019 HiSTEP Registration. Note: this selection is for information purposes only. This does not obligate you to a booth, nor does it guarantee space at a Hawaii Pavilion. A program manager will be in contact with the details. DBEDT/BDSD reserves the right to final decision. Export Research Tool Subscription used to assist company with market research ($1,000 maximum). Company has been in business for not less than one (1) year. Company has access to sufficient resources to bear the costs associated with trade, including the costs of packing, shipping, freight forwarding, and custom brokers. At a minimum, the company must have annual revenue of more than $200,000 in the previous year. Company certifies that it is not barred from receiving federal funds. Company produces goods or services of U.S. origin or have at least 51% U.S. content. Company has a business and export plan. Company is listed as compliant in Hawaii Compliance Express (HCE). For producers/manufacturers, priority will be given to companies whose Hawaii-made product meets the “Made in Hawaii” designation as defined under Hawaii Revised Statutes Section 468-119, stipulating that the product will have at least 51% of the wholesale value added by manufacture, assembly, fabrication, or production within the State. For service providers, the eligibility requirement is that the company be registered to do business in the State of Hawaii and the service, although for a foreign market, is substantially performed in Hawaii.